While The Garden Center Group's primary focus is helping garden centers develop better business skills to become more profitable, we also understand the long-term benefit of working closely with a select number of product suppliers. The "Partners for Success" Preferred Vendor status is offered to a limited number of companies that recognize the unique nature of the independent garden retail operation and are interested in developing methods that can help improve retailer/vendor relationships through open dialog, new product introductions and when possible, special pricing and offers for Group garden center clients. These Partners for Success value the focus and purpose of The Garden Center Group to independent garden retailers to be more successful. We wish to express our sincere appreciation to these companies for their support of The Garden Center Group! For more information on our Partners for Success and The Fall Event Sponsor Programs, contact Danny Summers (see contact information at bottom of this page). Partnering with The Garden Center Group to help grow your business and Color the World! Ball Seed is the leading North American distribution company in annuals, perennials, vegetables, tropicals, potted plants, cut flowers and more. You know us for some of our key products like Wave, Burpee and now WebTrack and WebTrack To Go (mobile version), Ball Seed's industry-leading business management system to place and track orders, manage business online and find images and marketing support tools. Live Well... Create! Bringing Superior Value & Unique Products to Clients of The Garden Center Group! The Border Concepts team seeks to provide the best lawn and garden products that are uniquely created for the independent retailers or wholesalers of America. What began in 1990 as a steel landscape edging systems manufacturer, has grown organically, expanding its product lines based on the needs the independent garden retailer and landscape professional. Today, product offerings include pottery, wrought iron collects, water features, home accents, fixtures, displays and accessories, animal statuary/figurines. 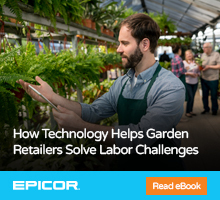 Epicor Eagle N Series software helps lawn and garden businesses thrive amidst the challenges of a concentrated selling season. Focus on your business and drive superior customer service, while your technology works with you seamlessly. Monrovia - Passion for Plants: Our expert craftsmen pour their hearts and souls into their work, and share our knowledge and love of plants with gardeners of every skill level. Our goal is to be your best business partner, a partner that helps you grow, helps you sell and helps you to be more profitable. Proven Winners is proud to support the members of The Garden Center Group. We are here to help your business grow with great new plants and programs to increase your sales. The Conard-Pyle Company is proud to support the members of The Garden Center Group. The Garden Center Group hosts a major event each year that has become recognized as THE event for retail garden center owners and managers. 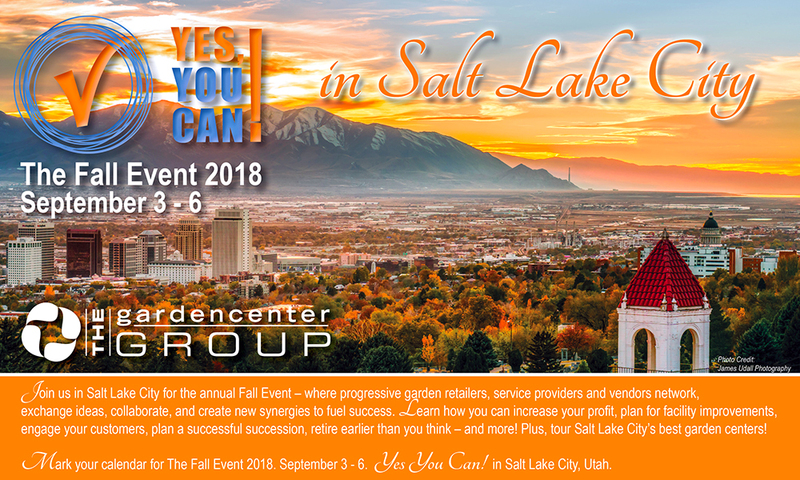 The Fall Event is four days of connection and collaboration between Retail Clients, Group Service Providers, and our Sponsors supplying the best in products and services for independent garden centers across North America. The following firms share and support the mission of The Garden Center Group... "Helping garden centers develop the business side of their business." Star Roses and Plants - Conard Pyle Co.
For more information about The Fall Event and becoming a sponsor, contact Danny Summers.